This sentence headed page one of issue one of volume one of the magazine published by The Parrot Society in January 1967. Not at all a bad sentiment, and one that still serves us well today, fifty years on. In the previous year, 1966, Norman D Cooper contacted fellow enthusiasts interested in the keeping and breeding of psittacine birds, and thereby founded The Parrot Society, as outlined in A Short History of The Parrot Society UK. Norman had retired from the RAF with the rank of flight sergeant. He converted two properties in De Parys Avenue, Bedford into apartments, which he rented out to tenants. He had a unique collection of Australian cockatoos and parakeets in aviaries that he constructed in the large garden of number 19. This collection included 3 varieties of black cockatoos, as well as Galahs (Roseate cockatoos), and he is the only person to have hatched a Gang-gang cockatoo in the UK at that time. Within a few months, the Society’s first magazine was published, with Norman Cooper as its editor. Its cover was of a thick paper, brick-red in colour, bearing a line drawing of several parrot species by Jim Hayward, one of the founder members of the Society. Inside the front cover was a list of three officers – Norman Cooper as Chairman/Secretary/Editor; Ken Hollingsworth as Assistant Secretary; and Eric Dracup as Treasurer – plus ten founding Council Members – J Robertson, L Knowles, H Mekin, T Alston, D Risdon, W Stroude, J Mollindinia, G Blundell, E Kinnin and J Scott. Inside the back cover were printed the ‘Rules of the Parrot Society’. Interesting to note the final paragraph, allowing the Council powers to set up a Disciplinary Tribunal to investigate complaints between members. Were they expecting trouble from the outset?! The initial seven pages of this first magazine listed the names and addresses of all 225 founder members of the Society. From my point of view (AKJ), some names stand out: Ron Oxley, John Mollindinia and John Walton as now much-missed deceased colleagues; Rosemary Low and Colin O’Hara as working colleagues and significant contributors to the Society (Rosemary’s first article for the magazine was printed in volume 1, issue 3, on the Black-headed Caique); and Lady Olive Baillie, of Leeds Castle in Kent. John Scott from Suffolk was a client for many years. A surprise was that of Dr and Mrs F G Startup, of Worthing in Sussex. Dr Startup was well known to me as a veterinary ophthalmologist, but I had no idea that he was also a parrot enthusiast! Members joining subsequently were listed in each month’s magazine until 1988, when Council cancelled the listing for security reasons. Printing of the annual complete membership ceased in 1975 as the increase in numbers filled a complete magazine! Following this list of founder members in the first magazine appeared the Chairman’s Address, also reproduced in full on a separate page. Then came a list of types of birds known to have been bred by members. There were some 32 species, mostly parakeets and lovebirds. There were no African Grey Parrots nor Amazon species, and just one Macaw species – the Blue & Gold! The annual subscription charged was £1-5 shillings (£1.25) to cover costs, and a report of the Society’s finances showed a healthy bank balance for the time of £253. Hence the treasurer proposed that, in spite of the published ‘rules’, all members should be allowed one free advertisement of fifteen words during 1967. Extra words, or additional adverts would then be payable at the agreed rate of 6d (2.5p) per word. By issue three in March, this was further modified to allow 45 free words per year. In October 1990, free adverts were limited to a maximum of three lines, as some advertisers sent very verbose copy! Issue 8 of Volume 1 in 1967 featured the first grainy black and white photographs, and in issue 10 a competition was launched to build a library of colour slides. These would be used both to illustrate the magazine (hopefully by December 1967), and would also be copied and loaned out to members to give talks around the country. The latter concept was moderately successful, but in fact colour photographs of parrots did not appear in the magazine until 1981. A black and white photograph of a Rosella appeared in November 1968. Colour plates were reproduced from a Belgian source, of worm eggs in December 1967, and of Kakarikis in May 1968. Internally, the magazine continued with its regular format of typed articles, comments, letters and members’ adverts. Correspondence and an ‘Advice Section’ featured heavily in most issues. Late in 1969, a series of articles by ‘A Veterinary Surgeon’ appeared (back then, vets were not allowed to advertise their services! ), addressing subjects such as the limited range of symptoms displayed by a sick parrot, and the importance of a post-mortem examination for diagnosis; psittacosis; flying accidents; feathers; internal parasites; breeding and sexing; ringing nestlings; and colour mutations. In June 1970 (just after I qualified!) a report appeared clearly describing the signs of Psittacine Beak and Feather Disease (PBFD) in a Cockatoo, although it was not recognised as such at that time. Much correspondence followed this article, together with the post-mortem report on this bird a year later. In 1972 the front cover illustration was changed to a line-drawn head of a sulphur-crested cockatoo with text, in yellow, black and white. Inside, the magazine showed improved printing and paper quality. In 1978 the cover design changed again, featuring a variety of parrots in silhouette, surrounding a projection of the world map, all on a blue background. The back cover featured an advert from Manor Farm Granaries, regular supporters of the PS for many years. The background colour was then changed annually, through yellow, green, red and pink. A further change occurred in 1982, when a reproduction of the famous print by Henry Stacy-Marks, entitled ‘A Select Committee’ was reproduced. So successful was this new cover in attracting new members that reprints of the issues for January and February had to be ordered! In 1984 the cover design changed once more to a reproduction of one of W T Cooper’s excellent prints used to illustrate Forshaw’s ‘Parrots of the World’, with this one featuring a group of Rosellas. The cover picture changed annually thereafter until 1994, when reproductions of Eric Peake’s excellent parrot prints were used until 1999. From 2000 until 2002, a selection of images from the renowned bird photographer Cyril Laubscher were purchased and used, while from 2003 until the present day images have changed monthly. Some have featured specific parrots, relating to articles contained in the magazine, while a few have illustrated events like our shows. The gradual improvement in print and paper quality over the years, and the progression from ‘in-house’ production by our editors Norman Cooper, David Coombes and Les Rance to out-sourced layout by professional designers (currently Neil Randle of Randle Design Consultancy) have resulted in an attractive, readable, quality magazine, representing excellent value for money to the Society’s members. Since that very first volume back in January 1967, and with the exception of Vol 1, issue 4 for April that year, your magazine has never missed a publication dateline in 50 years! An excellent achievement. From an initial list of founder members totalling 225 in 1966, the membership had risen to 431 in October 67 and stood at 600 by the end of that first full year, thus well exceeding Norman Cooper’s initial expectations! It rose steadily to 2,200 by October 1977. Annual subscription was increased to £1-10 shillings (£1.50) at the end of 1970. By 1987 it had reached £9 (£10 joint), with steady increases every few years thereafter until we reached the current (2016) level of £22 for a family membership, which covers all members in one household. An inflation calculator suggests that £1.25 in 1966 would now be worth £21.61, so it seems we are not too far out! Membership continued to rise, through 3,000 in 1981, 4,000 in 1985, to 5,000 at the 21st anniversary in 1987. At its peak the Society had close to 6,000 members, and although this total started to fall during the 1990s and 2000s (in common with many other specialist societies, and coinciding with the rise in the Internet), membership is on the rise again with the success of our shows and particularly the facilities offered at The National Show at Stafford County Showground. The Society’s bank balance also grew steadily, with funds accumulating to support a number of ventures, including conservation projects, of which more shortly. Minutes of these early meetings were written up in the magazine initially in a fairly casual style. By 1971, they appeared in a more formal form, with numbered paragraphs and headings. Printing of minutes then seemed to lapse for a few years, but after 1988, when a regular calendar of bi-monthly Council Meetings had been established, it was agreed once again that Council minutes should appear in the magazine, “after approval by Council”. The Minutes recorded several Tribunals to settle disputes between members, with some transgressors being expelled from the Society. Thankfully this is not something that has occurred in recent times. There was clearly ill-feeling between the PS and various other publications and avicultural groups in the early days, but again something that does not happen today. ‘Crosswords’ appeared in both senses – both in the correspondence and in the production of actual crossword puzzles with bird-related answers appearing in a few issues in 1972. It is true to say that Council has seen several strong-willed and stubborn characters! Several CMs or officers have resigned through the life of the Society, through “ill health, family reasons, or business pressures” (myself included). For many years Norman Cooper dealt with the Society’s correspondence and magazine production from his home at 17 De Parys Avenue, but in March 1982, as membership and work increased, it was proposed that the Society rent its own office space and employ ‘a clerical assistant’ to help with the workload. So 19a De Parys Avenue, Bedford, duly became the Society’s designated headquarters. Office staff had risen to two by 1985. Norman Cooper resigned as Secretary/Editor in 1986, but continued as Chairman until 1989. David Coombes assumed the role of Secretary and Editor, and in 1989 a move to new office premises at 108b Fenlake Road, Bedford was approved by Council. The minutes report successive purchases of office equipment over the years, to improve efficiency and keep up with the times. Starting with a telephone answering machine, this was followed by a fax machine, then a computer and a label printer! Computer hardware and software have been upgraded on many occasions over the years, together with printers and copiers, and eventually Internet connection with router. Following David Coombes’ well-earned retirement as Secretary/Editor in 2001, and Les Rance’s move into that busy position, another change of office premises brought us to the site at 92a High Street, Berkhamsted, Herts (2016 - the office moved again to its current Hardy House site in 2017, and again to Audley House in 2019). A number of topics recycle regularly in the reported minutes, as new CMs join, and resurrect ideas that have already been discussed in the past and been shelved for one reason or another. These include members’ adverts and their cost; membership cards; publicity for the Society; the involvement of a well-known personality as a Patron; additions and modifications to the Constitution; the purchase rather than renting of property; the setting up of a parrot sanctuary; and other ways of spending money! Over the years much useful contact with and representation at other bodies has been provided by officers of the Society, notably Aeron Williams, Colin O’Hara and Les Rance in this regard. Such bodies include MAFF, Defra, CITES, DoE, SUN (Sustained Users Network), CAWC (Companion Animal Welfare Council), the Zoo Federation, and others, all standing up for parrots’ welfare and the hobby of parrot-keeping on your behalf. The Society financed meetings headed by Colin O’Hara that gathered interested parties to draw up an Animal Welfare Bird Strategy in 2008. The PS became a registered charity (Reg. No. 268726) in 1975. Apart from exempting the Society from the payment of VAT (which had been introduced in 1973), this new status raised the profile of the Society. It did, however, lead to some changes to conform to Charities Commission rulings, although these changes took a few years to implement! Hitherto, Chairman/Secretary and Treasurer had been paid an honorarium, based on turnover, to reward their time and commitment to the Society. This was no longer allowed by the CC, but ‘reasonable expenses to cover travel and subsistence’ were permitted. The honoraria were therefore replaced in 1987 by a mileage allowance, and costs of refreshments at meetings and shows. The Secretary and office staff are the only persons receiving a regular salary for their work. Some changes to the Constitution and the format of the annual accounts were also required. This included the submission of accounts of income and expenditure from the various Area Groups (see below) and this always proved to be a difficult task to complete! Founding Council Members were considered also to be representatives for their geographical area of the country, but ultimately local Area Groups were established. The first of these was organised by PS founder member John Mollindinia at Luton, Bedfordshire in March 1973. 80 members attended, and new member David Coombes reported the event in the magazine. He wrote that ‘he didn’t expect a novice with just two Bourke’s parakeets and a pair of cockatiels to be made so welcome’! He did however find out that the reason his ‘pair’ of Bourke’s had not bred was because they were both female. In 1991, the idea of Species Groups was mooted, and several of these have existed under the umbrella of The Parrot Society, including Poicephalus parrots, Cockatiels, and Parrotlets. Very early in its history, the Society proposed a visit for members to Chester Zoo. The promotion in Volume III, issue 4 of the PS magazine offered the event at a cost of 8/3d (42p approx. - £6.40 at today’s prices!) per adult or 6/3d (32p) for under 12s, to include a three-course lunch! However, admission to the Zoo was an extra cost. Sixty-five members attended this event in 1969, and we returned to the Zoo for a conference in September 1991 and a very successful weekend seminar in May 2003. Fitting then that we returned to this excellent venue for or 50th Anniversary Seminar in September 2016. A ‘Parrot Convention’ was held at Aston University, Birmingham in the spring of 1986, with several British Avicultural speakers. A further seminar was held at Twycross Zoo in May 2010, with some international speakers. Attempts to get veterinarian Branson Ritchie from the USA to speak to a joint meeting with the Budgerigar Society on avian virus diseases proved unsuccessful, while a presentation by American animal behaviour expert Barbara Heidenreich was discussed for 2011/12, but was not managed as a PS event. She did, however, present at a separate meeting at London Zoo, and she was present at the 2016 seminar at Chester Zoo. The ‘Days Out’ are always successful from a social point of view, and cost the Society very little. Seminars or Conventions take a lot more organising and cost, and always lose money, but they are judged to be successful and worthwhile from a PR and educational point of view, and a means of giving something tangible back to you, our members. 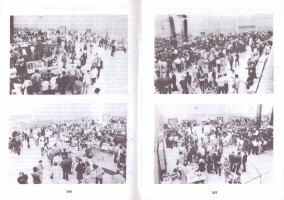 Once Area Meetings were established in the 1970s, each area would hold its own local shows or selling days. The PS also had a stand and a presence at the December National Exhibition, run by Cage and Aviary Birds. In 1981, a show for all members was organised at the Bunyan Centre, Bedford, and this was repeated in September 1982. The format was repeated successfully in 1983 and 1984, but car-parking problems became a serious issue, which meant that the Society had to find a new site. Meanwhile, attendance at The National Exhibition was losing money for the PS, so from 1983 the Society no longer had a presence there. In 1985 and 1986 PS shows were held in the Luton Sports Centre but the attendance was too large and the fire department stopped the queue to prevent overcrowding, so we had to move on again. A visit to Stoneleigh by PS officials judged car parking to be too far from the hall. Stafford County Showground on the other hand was in a good central position. Tom and Julie Bridge had been to dog shows and thought the site worthy of consideration. Officials stood in the main (Bingley) hall and it felt right, with all the space that was needed and more! The hall was duly booked for October 10/11 1987, and the Society has been back every year for the last 29 years. As more halls were built so the PS was able to fill them - Prestwood, Argyle and Sandylands. The new (at the time) technique of ‘surgical sexing’ appears to have been performed at PS shows by veterinary surgeon George Smith, from the early days of events at Bunyan Centre, Bedford, and continued at Stafford. With George’s easing out into retirement, Alan Jones was appointed show vet in 1988, and continued the service until 2003, when increasing protests from bird welfare groups, and the prevalence of infectious diseases such as reovirus and PDD made the practice of operating on parrots on-site unwise. PS members from the south of England repeatedly requested a show to be held nearer to them than Staffordshire (sites in Kent and Essex were tried), and in 1989 a venue at Pickett’s Lock, in Enfield, North London was proposed. A successful spring show was held, but costs rocketed the following year, and the exercise could not be repeated. In 1991 the Society tried Sandown Race Course, but the PS never reached the numbers of members and income that made Stafford such a success in the ten years that it held spring shows there. It never made a loss but the combination of the animal rights protests and the rising hire cost meant we had to close. Peterborough was proposed as a site in 2002, but never progressed. Harrogate was visited in March 2003 and Malvern later that year, but neither proved financially viable, and once again Harrogate was too far north for most southerners. In June 2006 the Society started a summer show at Stafford County Showground, which is still growing, and in 2009 a December ‘Help The Bird Keepers Show’ was held in the Argyle and Sandylands halls and that is also well attended and profitable. This venue appears to be the most suitable, and is now familiar and acceptable, and in spite of potential threats from the HS2 project seems set to continue as our regular venue three times a year for the foreseeable future. It is the success of the shows that ensures the PS prospers and is a leader in the avicultural scene. Since 2003, sponsorship has been received from The Birdcare Company and Johnston and Jeffs, with the latter still providing financial support and prizes to this day. Standards have risen year on year at these shows, with minimum cage sizes published; smoking in the halls banned; tables covered with white paper to improve appearance; the provision of transfer aviaries and a holding room; and the involvement of local police, Animal Health Inspectors, the RSPCA, and St John’s Ambulance. Pay kiosks and advance booking have been introduced, with early entry for PS members and disabled visitors. The Society relies heavily on, and is grateful too, the many people who assist with assembling and laying out tables, and clearing away afterwards, as well as security staff assisting with parking control and entry/exit through the many doors. Tables were originally rented, with payment to the hirer for transport to and from the halls. In 2009 the Society purchased its own tables jointly with SCSG, and these are stored on-site and let out for hire to other shows at the venue. This outlay has more than paid for itself since in hire fees, as well as reducing costs to the Society. In 2006 restrictions were enforced banning the sale of pet birds as we had no pet shop licence, and traders were also prevented from selling birds at the shows. This reduced our income from traders temporarily, but countered the increasing criticism and welfare issues raised by having large numbers of wild-caught birds for sale. This allowed only sale or exchange of breeding birds between members. Display aviaries from the likes of Chris Mason and Barrett Watson proved a great attraction, where captive bred and hand-reared birds could be seen and handled, but not sold from the showground. The Parrot Society has gradually embraced new technology over the years, and the rapid advance of internet communication. Early in 1999 a Parrot Society website was proposed, and CM Ray McMillan registered a domain name. The services of Ray Danks, of Filray Design were engaged, and a website came into existence, with David Coombes and Ray McMillan advising. To avoid confusion with similarly named groups around the world, Council agreed to change the name of the Society to ‘The Parrot Society UK’, and this change was made to the domain name thus - www.theparrotsocietyuk.org. Ray McMillan resigned from Council in 2003 as increasing health issues prevented his travelling to meetings, but he remained webmaster until 2005, when Cliff Wright as Chairman took over the role. Worldpay facilities were added to the site in 2004, and Garry Steptowe became more involved as webmaster from 2007. Kevin Pickup is currently most actively involved in modifying and updating the site (At 2016 - clearly the website has now been extensively re-designed and re-launched in 2018). The latest Internet venture has been to produce the monthly magazine in on-line electronic form for international members, thus saving the high costs and potential delays of posting out the printed copy. For an annual subscription at the same rate as UK members (currently £22), members overseas may sign up to the service and read the magazine on-line, via a password-controlled, personal access code. So far the Society has not become involved with social media such as Facebook, Twitter, Whatsapp or Snapchat, but it does have a minimal presence on the professional networking site LinkedIn. This technology is evolving so rapidly that the PSUK will need to keep abreast of such developments and embrace the future, especially if it is to attract younger members. The opening sentence of this article suggests that parrot conservation has been a key feature of The Parrot Society since its inception, and it has been able to fund requests worldwide over the years. The earlier years were not quite so focused on this aspect of parrots, but the provision of a table at the show in 1986 to collect funds for the Dominican Parrot project has already been mentioned. The formation of The World Parrot Trust in 1989 seems to have stimulated more activity in this regard, as in 1990 nearly £7,000 were awarded to projects including the status of the Hyacinthine Macaw, research into PBFD, a minibus promoting the St Lucian parrot, and work to save the Echo Parakeet in Mauritius. A separate Conservation Fund was established, and printed sweatshirts were produced, with all sale proceeds going to the fund. The Dominican Parrot appeal was further supported, and during his time on Council David Williams acted as conservation officer, ensuring that further projects involving Amazon parrots were funded, since these birds were his particular passion. It is perhaps worth mentioning Thomas Arndt’s Lexicon of Parrots, which – following a suggestion in 1991 – was translated and published in English (from the original German) by Tony Pittman. £5,000 from the proceeds of its sale via the PS went to the Conservation Fund. In 2002, Gift Aid claims were made, a system whereby charities may reclaim tax back from working tax-papers who have paid subscriptions to the Society. Over the years since, Gift Aid has generated many thousands of pounds, and Garry Steptowe works tirelessly on the necessary annual submissions. In 2006, 10% of subscription income, and all Gift Aid monies were paid into the Conservation Fund to boost this side of the Society’s work. John Mollindinia’s legacy has been mentioned: In 2011, PS member Peter Spalding left the proceeds of the sale of his house to the Society’s conservation work, and this money has also boosted particular projects since. Funds have been granted to research into PDD (Macaw Wasting Disease, Avian Bornavirus) initially to Central Veterinary Laboratory in Weybridge, and latterly to the University of Giessen in Germany. The Red-vented Cockatoo and the Echo Parakeet were further supported, as well as the Kaka parrot in New Zealand and Scarlet and Great Green Macaw breeding and release in Costa Rica. Tony Pittman headed a Conservation sub-committee after David Williams left Council, but after a while it was found more effective to involve the whole of the Council, and four members were charged with responsibility for four worldwide geographical areas. Currently funded projects include Lear’s macaws and Grey-breasted parakeets, and all were discussed and reported upon at the 2016 Chester. Reading through years of past magazine and Council minutes has been an interesting and educational experience. There is a lot more that could have been written about and expanded upon, but I think we have captured the essence of the history of The Parrot Society UK, hopefully without getting bogged down in boring minutiae. There was for many years a successful Prize Draw (also known as the Parrot Society Lottery), but this eventually petered out as interest in it waned. A special booklet on the endangered Swift Parakeet was published to celebrate the millennium (2000). Further special booklets on The African Grey Parrot, Keeping Cockatiels, and a Beginner’s Guide to Parrot Keeping, among others, have been produced. Financially the PS had a bad year in 1999. Inflation and interest rates had been high in the 1990s, and there had been large outgoings on colour plates for the magazine, new office computer equipment, the production of the commemorative Swift Parakeet booklet, and the setting up of the website. For most of its life, however, this thriving group of parrot enthusiasts, run by a council and officers who equally share a love of these remarkable creatures, and understand the problems and joy of parrot-keeping, continues from strength to strength. We are pleased to be celebrating 50 years of The Parrot Society UK , and look forward to our successors celebrating its centenary in 2066!